Greetings from MOONEYES! This is Steve from MOON SPACE AGENCY. On Saturday April 13, 2013 the 5th Annual Hippy Killer Hoedown took place at Wild West Arena in Winchester, California. The Hippy Killer Hoedown is a custom car and motorcycle show organized by Kutty Noteboom and Lisa Ballard (and others) that features vendors, live bands, food, cars, bikes and more. Kutty has been a guest to HCS several times in the past with his custom motorcycles. The day after the event was the Pomona Swap Meet too. It was the first time for me to attend either event so I was excited to see what it was like. 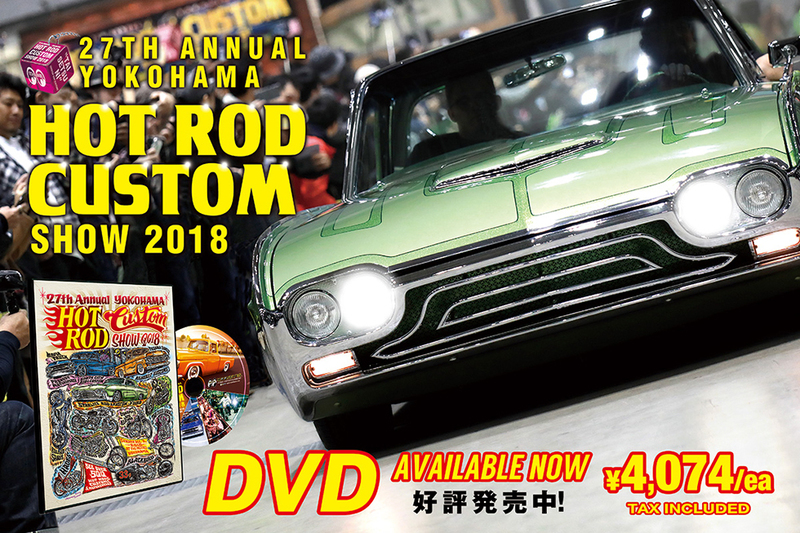 I arrived in the afternoon on April 11 at MOONEYES USA. The weather was nice and everyone was busy at the shop preparing for the weekend of events. I took a look at the MOONEYES Dragster as it was in the reconstruction phase. Everything looks good and it's just a matter of putting it all back together. The next day was final preparation and loading in the morning then our departure for Hemet, California in the afternoon during rush hour traffic. The road trip, technically speaking, isn't too far. From Santa Fe Springs to Hemet is just over 80 miles (130 km) east. However, traffic plays a big roll in traveling and last year it took almost 4 hours to get there. Recently in California, they started a toll system on their freeways (I guess it's not "free" with this option) called Metro Expresslanes. Compared to ETC in Japan, the system is over complicated, charging by the number of people rather than just the vehicle. In any case, this was to make things easier and faster for traveling. Initially, there was more traffic in the toll lanes than there were in the free lanes! However, it soon changed for the better and we were moving along much faster than the normal traffic. One of the down sides of this system is once you are in the toll lanes, you cannot exit at your own free will. We arrived in Hemet in just over 2 hours. After checking into our motel, it was time to head over to the Dice Magazine/HKH preparty! At the preparty, Kutty's band The Whitewalls performed. That's Kutty on the right! Outside were a lot of bikes and cars too. Many people travel out to Hemet for the event a day early and camp on the grounds. The party is held at a local saloon (bar) which is on the same grounds as the event itself. If you walk too far outside, it was pitch black! However, the sky was bright with so many stars. Looking out into the distance, you could see the city lights beyond the hills. California country with white fences and all. Amazing. Back inside, the party kept going all night! The Hemet morning fog was thick! You could barely see past your own hand. It slowly goes away and the morning skies turn blue. We set up our booth before 9AM, with about an hour to spare before the official opening of the show. The event location is literally on a ranch style grounds with bleachers surrounding the area used for the rodeo shows as well as stables for horses, old campers and barrels scattered around. By 10AM, cars and bikes began filling up the reserved space allocated to custom cars and bikes. I wasn't expecting to see this many people, the turn out was awesome. Some of the early birds that arrived. There were all kinds of cars and bikes to see. The vendor booths had some familiar faces. Hippy Killer's booth was handled by Kutty's wife Jamie and friends. They were super busy all day. Salinas Boys Cole Foster and Susan had a booth too and Susan was working non-stop! Below are just some of the vendors that were at the event. As the day progressed, the took a walk through the event and reserved parking area. There were hundreds and hundreds of bikes. People began to gather in the open area that's normally used for the rodeo. They were going to start the mini bike races! Slowly, they approached the starting line. There were seven racers. All of them on 5hp mini-bikes. As the rag dropped, they all pull-started their machines and got underway! They leading rider made a mistake and literally did a face plant in the dirt! By this point, I didn't know how many laps each of them had done nor did I know who was leading. It was chaos! Fun! After the adults finished their race. They called on any kid racers for the next heat. Two boys on mini bikes were up for the match. As you can see, the red helmet took off and was lead the race from the start. However, he ran into trouble with two laps to go! The yellow bike made the pass and held on for the victory! I was ready to watch hours of this stuff~! However, it was over and everyone was happy. Good times! Now it was off to check out some of the customs. So much to see! For lunch, we had delicious Mexican Food! The overall scene at the 5th Annual Hippy Killer Hoedown 2013. Great day! A couple of the live bands that performed. Bands included Supersuckers, Jonny Two Bags, Bob Wayne and Red Devil Squadron. Towards the end of the day, bikes and cars were still coming and going. Some had better ideas. This rider (left) was taking a break before her long journey back to Los Angeles. Lisa Ballard (right) sporting a MOON hat managed the gate the entire day! A job well done. The Hippy Killer Hoedown is an awesome event and worth making the trek out to Hemet to see. Pabst Blue Ribbon sponsored the beers (until they ran out), the mood was positive all day and there was a ton of stuff to see. Some of the things that stood out in my mind include Cole Foster's Panhead, Scott Jones' Pan-Shovel, Speed Merchant's Triumph, Kutty Noteboom's Shovelhead, the killer paint on this custom and the list goes on! Can't wait for the 6th Annual Hippy Killer Hoedown 2014~! After we made it back to Santa Fe Springs, it was time for dinner so we ate at Chris' & Pitt's Bar-B-Q in Bellflower before heading back to the motel. Tomorrow would be another early start as it was time for the Pomona Swap Meet! When you exit on Fairplex Dr, you know you are close. The traffic starts there and it take about 30 minutes just to get to the parking lot. If you can imagine something like the size of Street Car Nationals in Odaiba, Tokyo. There are close to 1000 cars, all categorized by makes and types. All cool cars! That's what the Pomona Swap Meet car lot is like but almost every single car is for sale! (By the way, SCN2013 is Sunday May 19 in Odaiba, Tokyo!) If you are ready to buy your favorite car, go to the Pomona Swap Meet! You will find it there! The swap meet section was a treasure hunter's dream come true. Miles and miles of walking around. This swap meet isn't just shops but actual swap meet style vendors. The swap meet is also categorized with vendor shops in one area, VW market in one area, etc. If you plan on going to the Pomona Swap Meet, be sure to prepare for major walking. This place is huge and you will want to be in shapre to see it all. There isn't an official closing time, but it's around 2PM. It was a great trip to USA! The weather on Sunday was overcast but that might have been a good thing because the heat and sun at the swap meet would have been crazy. I hope you enjoyed my USA Trip Report! Thank you for reading and viewing the photos.